Raymond Schroth's Bob Drinan: The Controversial Life of the First Catholic Priest Elected to Congress shows that the contentious mixture of religion and politics in this country is nothing new. 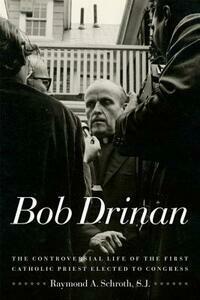 Four decades ago, Father Robert Drinan, the fiery Jesuit priest from Massachusetts, not only demonstrated against the Vietnam War, he ran for Congress as an antiwar candidate and won, going on to serve for 10 years. Schroth has delved through magazine and newspaper articles and various archives (including Drinan's congressional records at Boston College, where he taught and also served as dean of the law school) and has interviewed dozens of those who knew Drinan to bring us a life-sized portrait. The result is a humanistic profile of an intensely private man and a glimpse into the life of a priest-politician who saw advocacy of human rights as his call. Drinan defined himself as a "moral architect" and was quick to act on his convictions, whether from the bully pulpit of the halls of Congress or from his position in the Church as a priest; to him they were as intricately woven as the clerical garb he continued to wear unapologetically throughout his elected tenure. Drinan's opposition to the Vietnam War and its extension into Cambodia, his call for the impeachment of President Richard Nixon (he served on the House Judiciary Committee, which initiated the charges), his pro-choice stance on abortion (legally, not morally), his passion for civil rights, and his devotion to Jewish people and the well-being of Israel made him one of the most liberal members of Congress and a force to be reckoned with. But his loyalty to the Church was never in question, and when Pope John Paul II demanded that he step down from offi ce, he did so unquestioningly. Afterward, he continued to champion the ideals he thought would make the world a better place. He didn't think of it in terms of left and right; as moral architect, he saw it in terms of right and wrong. This important book doesn't resolve debate about issues of church and state, but it does help us understand how one side can inform the other, if we are listening. It has much to say that is worth hearing.